One of the most common complaints our Las Vegas veterinarians, Dr. Terri Koppe, Dr. Laura Klaassen, Dr. Alissa Lansing, and Dr. Ashley Love hears at our cat hospital is the problem of inappropriate elimination -- the unexplained inability or refusal of a cat to follow his or her litter box training. There are many possible reasons cats may deviate from their normal litter box routine, ranging from medical problems to emotional stress. Unfortunately, too many owners give up on finding a solution to the problem; in fact, inappropriate elimination is the number one reason cats are turned over to animal shelters for euthanasia. Even owners who keep their cats may become increasingly frustrated by this problem, increasing the tension level in the home. It is often mistakenly believed that cats are intentionally eliminating outside of the litter box for spite toward their owners. Actually, most cats are responding to the situation within the home by their behavior, usually unhappy and distressed instead of vengeful. Here at All About Cats Veterinary Hospital, we can help owners determine the underlying cause of the problem and advise them on the proper method for reversing the situation. The first thing to do in these cases is to let our cat hospital screen for signs of a possible health condition. A variety of ailments can cause urinary pressure or pain, making it impossible for even the most obedient cat to use the litter box properly. Bladder or kidney infections, for instance, can make urination difficult or even impossible, but are treated with medication including antibiotics and often result in improved litter box usage. Cats are also vulnerable to stone or crystal formation in the urinary tract, bladder or kidneys, another condition that inhibits urination. Even tumors in the bladder, although rare, can shut off the urinary system entirely. Unspayed female cats may have trouble controlling their urination or defecation due hormonal influences. Elderly cats can have a number of ailments affecting their habits including arthritis, weakened urinary muscles, or even a cognitive decline that impairs their awareness and reflexes. Conditions that cause excessive urination and defecation, such as diabetes, kidney disease, or hyperthyroidism can be the culprit for changes in litter box visits, but will respond to proper care from our cat clinic. If our veterinarian finds no physical cause for your cat's affliction, then it is time to consider environmental and emotional factors. First look closely at the litter box and the cat litter. The number of litter boxes, the size of the boxes, whether they are covered or uncovered, the type of liners (or lack thereof), and how often you scoop, dump or clean the box can all affect your cat’s willingness to use the box. For example, if you switch brands of litter and your cat does not like the new brand, your cat may stop using the litter box. If you have recently moved the litter box, your cat may continue eliminating in the same location despite the fact that the box is no longer there. It is possible that your cat will develop an aversion to the litter box should an unpleasant experience occur while he is there. For example, your cat may have been startled by another animal in the household while using the box and consequently associate this fear with the litter box. If your cat had a medical problem causing pain with elimination, then the cat may associate this pain with the litter box and refuse to use it. 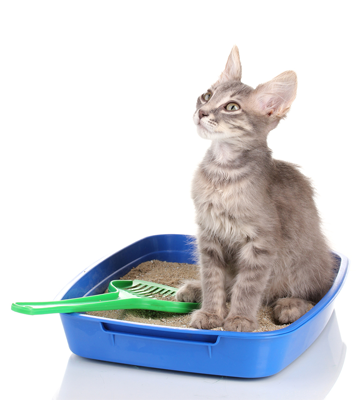 Additionally, social influences can have a significant impact on litter box use. For instance, if your children play near the box, your cat may feel stress due to the noise. If your schedule has suddenly changed due to work or travel commitments, your cat may be experiencing anxiety that is affecting his litter box behavior. Finally, cats are territorial creatures who regard the smell of urine or feces as a marking of territory. They may "overwrite" the odor of a previous animal's urination or defecation, or they may keep returning to the scene of one of their own accidents. Our Las Vegas cat hospital can discuss your pet's behavior, note any problems in the litter box environment, and help you make the right choices to restore your cat's behavior in a loving and supportive way. Contact our veterinary team for a consultation today.